"A gorgeous and indulgent smoothie, but totally healthy!" 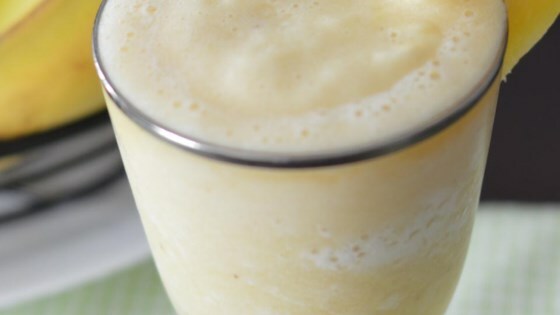 Place ice cubes, pineapple, banana, and pineapple juice into the bowl of a blender. Puree on high until smooth. This smoothie is excellent and very tasty. Notation: you can add natural canned pineapple as well when you are short on time i tried it w/canned pineapple as well it was tasty also. This was refreshing but not one my favorite. My kids liked this okay. I used a frozen banana and omitted the ice. I think this would be stellar as a drink for grownups with some Malibu coconut rum! I loved this recipe especially because i put in aliitle more pineapple and pineapple juice. If you put in half the banana and put in 3 hulled strawberries it's delicious.